The night before we began this CD, we rehearsed in the church in London where the recording was to be made. We had just started the first sonata, (the fluttering of Gabriel's wings, holiness descending unto Mary), when from a far corner of the building, a pigeon appeared. My first thoughts were that this could seriously disrupt the recording. However, the pigeon merely circled once round the church, after which it mysteriously disappeared, never to return. 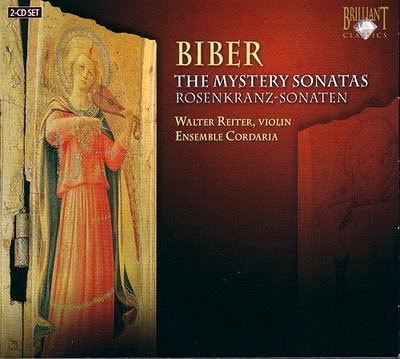 Violinist Walter Reiter describes a small miracle in the notes for his recording of Biber's Mystery Sonatas with the Ensemble Cordaria. Originally released by Signum Classics in 1999/2000, the sonatas are now available at bargain price from Brilliant Classics. I paid just €11.00 for the 2CD set in France. Wonderful playing and excellent sound captured by engineer Mike Hatch in St. Silas Presbytery, London, and Orford Church, Suffolk. The Mystery Sonatas are fifteen 'mysteries' or meditations on the life of Christ and the Virgin Mary, and they were written almost three hundred years before Messiaen's Vingt Regards sur l'Enfant-Jésus . They are also known as the Rosary Sonatas. But fear not; musically they are far more appealing and lively than their rather forbidding subject matter suggests. Besides, how many recordings do you have which include a lirone and a regal? At super-budget price this outstanding double CD should be in every collection. 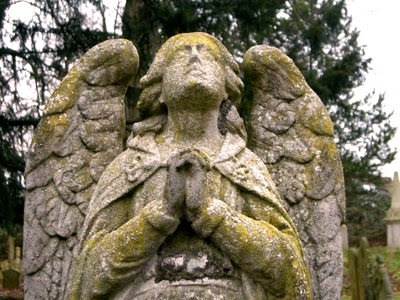 My photos show, quite appropriately, three of the angelic residents of the Rosary Cemetery here in Norwich. 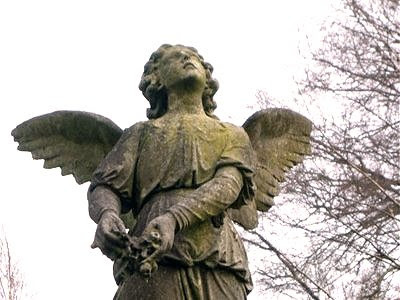 Founded in 1819 it was the first non-denominational cemetery in the UK and is still in use. 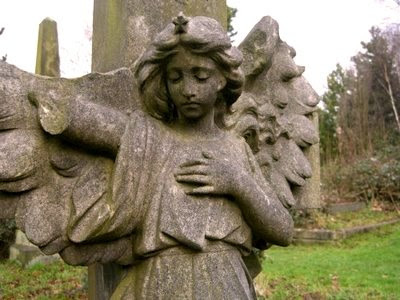 The 13 acre site has some extraordinary Victorian and Edwardian tombs, three of which are shown above. Biber appears among yet more interesting company here. Writing this post prompted me to dig out the DG Archiv recording of Biber's Missa Salisburgensis. This is a big work, made even bigger by being given the full Paul McCreesh treatment with the added forces of Musica Antiqua Köln directed by Reinhard Goebel. Great fun, and irresistible at a budget priced double CD. 11 Euro for the Biber CD! How about £3.99 from selections.com? I have used this supplier for a couple of years abd they are excellent to deal with Particularly good for Brilliant Classics, Regis, and Alto. The other Cordaria CDs are the Vivaldi sonatas (1st recording on period instruments) and Un'alma innamorata (includes 1st recordings). The Mondonville CD won a prize in France, and as it is French music, this is quite a big deal.